What an honor to be included in Stephanie’s Handmade Ornament extravaganza! I’m Mandy from Little Birdie Secrets, and this is probably the easiest handmade ornament you’ll ever make. Enjoy! 1. 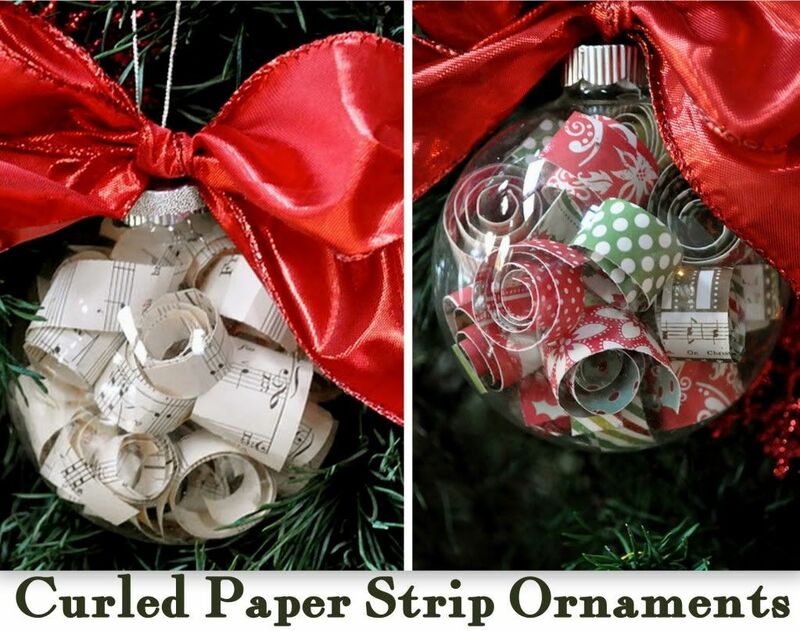 Cut strips of patterned paper or sheet music into strips of varying widths. Mine were between 1/2″ and 1.5″. 2. Curl your paper strips around a pencil or paint brush. Hold the curl tight when you get to the end. 3. Remove the top of the glass ornament and insert the curl in the top. The curls will uncurl a little when they get inside. Continue adding strips until full. 4. Replace the top. Tie a ribbon in a bow in the loop at the top. Tie a loop of thread or twine through the same loop to hang on the tree. That’s it! 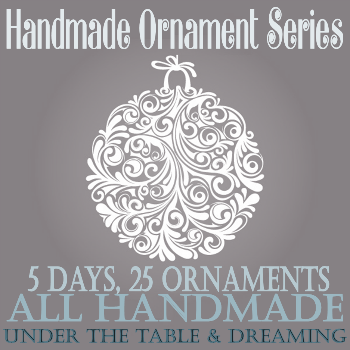 Hang your gorgeous ornament on your tree! Here’s the same ornament with patterned scrapbook paper curls. So festive! Thanks so much for letting me share my super simple ornament with you. These make great neighbor gifts, too! Merry Christmas! Thanks so much Mandy for sharing these adorable ornaments and contributing to this years series. 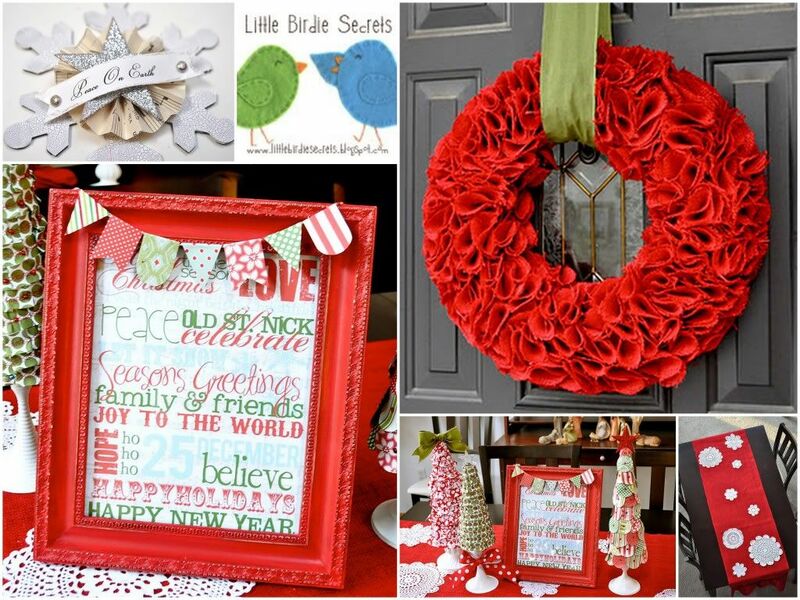 I love this – reminds me of the Christmas crafts I did with my mother as I was growing up. I have a Music Room… and how PERFECT for the tree in there…. I could also see this in a library with old worn out books. OMG, I just came accross a box of these plain glass ornaments and wondered what I could do with them. I needed some more white on my tree, now I know exactly what to do. Couldn’t have been better timing! Thanks so much for this cute tutorial! GORGEOUS! This is me… running as fast as I can to find some clear ornaments! What a fabulous post!!! Cut up and curl a wedding invitation and leave the details visible (names, date, venue etc.) then gift the ornament to the couple. 🙂 I did this in the summer and the couple really loved it. It makes a wonderful 1st married Christmas present. I have filled these with sheet music and snow..I love what was done here..Thank you for the idea.. These are so pretty! I love the sheet music inside idea! I did something very similar this year using newspaper and magazine strips. With all the Christmas catalogs I got I had plenty of winter colors! I am making this ornament wirh my son’s seventh grade class. His teacher is thrilled! I made a sample and it was beautiful. Thank you! I went to Michael’s and purchased Christmas scrapbooking paper and sliced differenr colors and prinrs on a paper cutter.